Let’s talk about how to set up wireless broadband connection in this article. 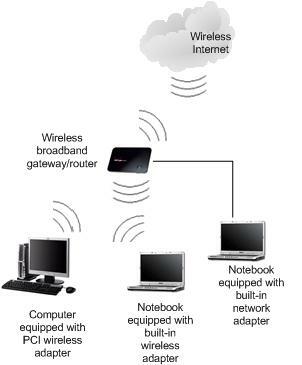 As you know nowadays you are not only able to set up wireless connection at home by using wireless access point or router, but also can subscribe wireless Internet connection service from wireless Internet service provider (WISP) to connect your laptop or several computers to Internet without the need of any phone line or other cable connection. This is an alternative Internet connection for Cable, DSL, or dialup connection. Basically the WISP just make uses of 3G (UMTS, EDGE, HSPA, HSDPA, etc), 4G(Wimax) or other latest wireless technology to provide this kind of Internet service. What you will be provided is a USB or PCMCIA wireless broadband modem (usually is provided by service provider) that can be plug into your laptop or computer easily, and it works as modem to connect your laptop to Internet. 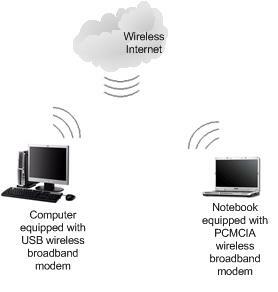 Please note PCMCIA modem can be used on laptop only, but USB modem can be used on both laptop and desktop. The main advantage of this modem is you can bring it together with you laptop easily and connect everywhere in broadband coverage. The main drawback is only one laptop/computer can connect to internet at any time if you only have one modem. It’s not difficult to set up, if it's plug-and-play (already pre-configured by service provider), you will be prompted and guided to install connection manager software and driver after plugging in the card (If not, installation CD will be provided). Once you have connection manager installed, you can use it to detect wireless broadband network and connect to Internet. If it's not plug-and-play, you are probably required to make some minor configuration in connection manager by providing username, password, APN (Access Point Name) and SIM PIN code (if your modem contains SIM card), all this info are provided by service provider. Sometimes you are required to configure more network settings too. Ok, if you have several computers (equipped with normal wireless adapter) at home that need to connect to Internet at the same time, and would like to subscribe wireless Internet service for this purpose, check with WIPS to see whether they provide wireless broadband gateway with built-in modem that can provide 802.11b/g/n Wireless routing capability. If it’s available, then you can have several computers connect to this gateway with 802.11b/g/n wireless connection and access to Internet. In order to use it, most of the times you need to do some configuration. On Internet setting, mostly likely you are required to configure username, password, APN (Access Point Name) and SIM PIN code (if your modem contains SIM card). On LAN setting, you need to configure the SSID, channel, connection mode, encryption key and DHCP, so that other computer can join wireless network successfully. If there are RJ45 network ports on gateway, you can have network cable connection from computers to gateway too. Don't worry if you only have USB or PCMCIA wireless broadband modem, you can purchase Cradlepoint MBR900, Novatel Wireless MiFi 2372, Linksys WRT54G3G, Netgear 3G MBR624GU, D-Link DIR-451 or other wireless broadband routers to share Internet connection to other computers. Make sure that the router you plan to purchase supports your wireless broadband modem. After reading this article, hopefully you now have better understanding on how to set up this broadband connection. If still having problem, always check with technical support from service provider in order to solve the problem. Return to top of "Setting Up Wireless Broadband Connection"! !